These bowed-bay French Door swith side lites and transom, separate Blue Ox Millworks from most other custom manufacturers. 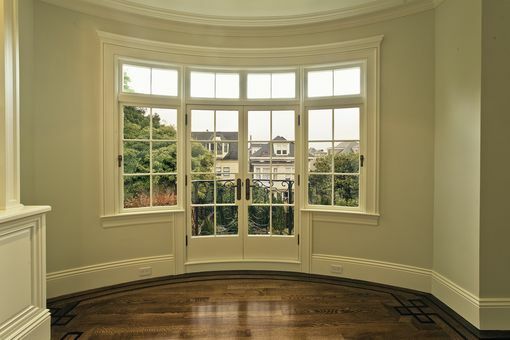 Bowed-bay means a door and side-lites that are curved when one looks down from above the window. Though difficult to make, nothing touches the beauty and awe-inspiring look of true bowed-bay windows. These units were made from mahogany 2 1/2 inches thick and feature true divided lites, with all mortise and tennon construction. Also made for this completely remodeled home in San Francisco were 50 other units including 4 bowed units, operable 6ft tall oval windows, and elliptical skylights. Contact artisan for further details. Dimensions: Bowed French Door dimensions: 24in x 8ft tall Complete Unit with bowed site-lites 10 ft tall and 12 ft wide.